Shot during the initial tremor…People run for wide streets in Tokyo, as the Magnitude 9 earthquake hits the north east of Japan. ©Jeremy Sutton-Hibbert 2011, all rights reserved. Today is the 2nd anniversary of the Great East Japan earthquake, which happend at 2.46pm on Friday March 11th 2011. Approximately 19,000 people died and many thousands are still missing, and hundred’s of thousands now displaced from their homes. The earthquake, the 5th largest ever recorded, triggered a massive tsunami which washed away whole communities. The Fukushima Dai-Ichi nuclear plant suffered damage and over the next few days 3 reactors exploded. 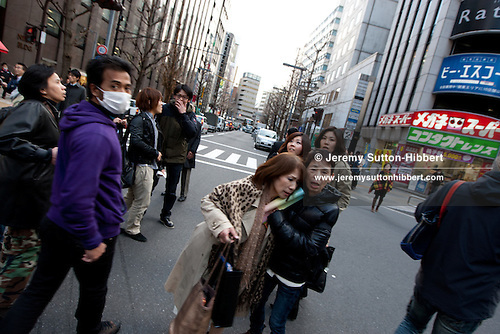 I was based in Japan, for my work as freelance photographer working for editorial clients worldwide. I wrote the below a little time after the first weeks of the quake, when I began jotting down all my memories of that time. Spanish David wanted to meet at 3pm. But I was away out in the east of Tokyo, near the new SkyTree, shooting on assignment. A beautiful day, sunny blue skies, crystal clear. The day had gone well, the shoot was finished, all the pictures were taken. So I crossed the city, two trains, over to Shinjuku. Spanish David and I hadn’t arranged a specific spot to meet, but we both knew where it’d be. I got there early, ambled around, went into shops, checked out the prices of some things I need and the prices of some things I don’t need. Killing time, checking the watch, and with no way to contact David, I awaited his call, or message. Then I saw a woman, dressed in black, standing in a doorway, hands on lintels, looking left, looking right, looking agitated. I watched her for a second or two and at that moment I felt it. Something wasn’t right. Perhaps I was light headed, it’s happened a few times recently. But no. Other were beginning to notice also. The ground was moving, things were beginning to rattle, to make noise. Earthquake. A man near me pulled his jacket over his head, to shield himself from any glass, or debris, which was about to fall. I was thinking fast, almost automatically now- run to open space. I was in a street, either side of which was festooned with neon lighting, advertising. The last thing I wanted was for those to fall on me. I started to jog to the open road up ahead, not a wide open space, but wider and more open than where I was. As I ran others around me began running also. It was obvious this tremor wasn’t a minor one, the momentum of the tremor seemed to be mounting, as did the momentum of the runners now all headed towards the open road. In front of me a man, a salaryman stops running, I’m inches behind him and have to push him slightly as he becomes an obstacle in my path. He moves forward a little, and I realise how easy it’d be for someone to fall, to be pushed, to become an obstacle in a stampede and to get hurt. All this I realise in lightening fast time. My bag is on my back with all my cameras in it. I want one out, I want to be shooting. The quake is still rumbling. I make it to the wider street, straight out into the middle of the road. There are many people now heading there. People were pouring out of restaurants, out of doorways, out of buildings. The traffic was stopped. I get my camera bag, grab my camera of choice and immediately start shooting images around me. Anything. People. Just shooting, trying to capture some sense of the ongoing, some sense of urgency, some sense of fear. I see a woman with fear or panic on her face, leaning on the shoulder of another. I’m straight in, bang, bang, two frames. The woman shields her face to hide herself from me, but it’s fine I have it. I keep moving. People are on phones, trying to talk, trying to send messages. People are pointing skyward, I glance up to see what they’re looking at but see nothing, so I turn back to shooting images. I’m trying to shoot and also to phone my wife at the same time. But the lines are busy. My iPhone keeps coming up with some button I don’t quite understand, will it call them back automatically or do I need to do it ? I keep trying, but the battery I note is already going down. A whole day of walking and photographing on assignment in the east of the city, and listening to Bob Dylan incessantly, has taken its toll. Then it started again. The ground moved. Shaking. More angst in the street, more pointing. I have no idea yet where the epicentre is, or how big the magnitude of the initial quake, but I know one thing. Someone, somewhere is dying. I walk the streets for what was perhaps an hour. Looking for signs of the quake. I photographed people watching a TV screen in the doorway of Kamo Sports. I photograph a broken kerb step into a building, with tape over it. People on phones. And just beside the station, I photograph in beautiful sunlight, with dark skies, ominous skies, people standing still waiting. Waiting for the next tremor perhaps, waiting for the train lines to reopen, waiting for it to be all over. After a while the momentum has passed. It seems there’s not so much left to shoot, other than people waiting. I try the station, all train ticket gates show no entry signs. People mill around, people sit politely on the stairs at the sides leaving way for others to ascend and descend. I still can’t get through on my mobile to home. We’ve had one successful text message each way, and then nothing for over two hours since the last tremor. I’m beginning to worry. I consider my options. I’ve images, timely images, and they need to be transmitted. There’s nothing much else to shoot. Soon, all of mankind will pour out of their offices and be looking to get home. I decide. It’s time to go. I aim for a bus which will take me to near my home and to my surprise I manage to get on the first bus out. Standing room only. The air is heavy with worry and heat. A pregnant woman soothes the unborn child inside her. The window is opened and brings fresh air. People have lost their inhibitions about speaking on their phones and do so freely. A woman watches the disaster on her phone, and holds it in such a way others can see it also. Another woman holds up the already slow moving bus by trying to pass her travel card through the passengers to pay for her journey, unable to reach the ticket machine herself. I check my phone, emails are beginning to get through. From Getty Images I receive emails asking about my safety and about my availability for assignments in the quake’s aftermath. From The Times bureau, “can you head north with us ? Call us as soon as you can”. From another client, “are you available?” Skype is working and I try having one or two chats via that. The bus finally arrives and empties it’s cargo of worried passengers. All along the route there’d been others walking their journey home. I run to the train station, still 4km from home, from family. The trains are off. I return to the main road and miraculously find a taxi. I hold the door as a woman pays her bill and exits it. A Japanese guy beside me wants to share the cab. We enter and decide on our route to our neighbourhoods. He doesn’t speak English and my poor Japanese makes for a quiet journey, but bar directions and which route to take no one seems to care. The taxi inches along, and knowing the roads well I contemplate putting my marathon training to good use and running home. I watch the roads, I watch the taxi’s navigation screen, 4km to home, 3km to home. Should I run? I wait until after the train line. But then things begin to move more freely, and then they slow again. Finally the moment comes where it makes more sense to get out and walk, or jog home. And I do so. Into my home, to my waiting and worried family. Somewhere a catfish lays exhausted, contented. ©Jeremy Sutton-Hibbert 2011, all rights reserved.